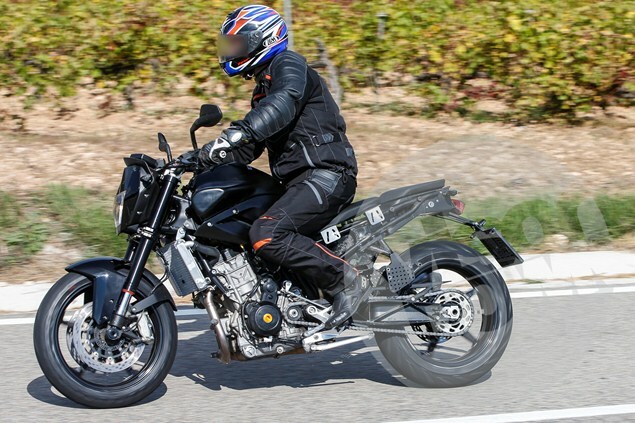 HERE’S a first look at a new addition to KTM’s Duke family, filling the gap between the 690 and 1290 Super Duke R.
It’s expected to be around 800cc but will be called the Duke 890, in line with the rest of the range. Where the 1290 is a V-twin and the smaller Dukes are singles, this new one is a parallel-twin. Behind the section of exhaust pipe you can see is a second one exiting the right-hand cylinder. Like the other models in the range, it's got a steel trellis frame, although it's mostly obscured by bodywork and rider in this shot. The swing-arm is double-sided in common with the smaller Dukes, where the 1290's is single-sided. Styling is closest to the 690 variant, with a similar headlight unit, which is less angular and aggressive-looking than the 1290's. Expected to arrive in 2017, it will bring a fifth capacity to the current Duke range, which also includes the 125 and 390 models. It's the second secret KTM to be revealed on Visordown today, along with an updated 1190 Adventure. Both were spotted being tested in Spain.